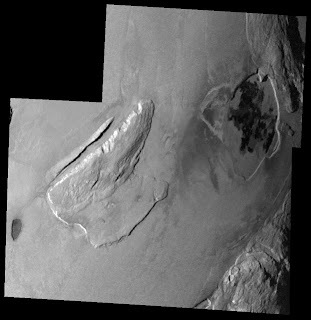 The next LPSC abstract I want to discuss here is "Geologic Mapping of the Hi'iaka and Shamshu Regions of Io" by Melissa Bunte, Dave Williams, Ron Greeley, and Windy Jaeger. The poster will cover geomorphologic maps of the regions around Hi'iaka Patera and Shamshu Patera based on medium-resolution imagery acquired during Galileo's I25 and I27 encounters and the lower resolution color mosaic taken during orbit C21. Both volcanoes are in the equatorial region on the leading and sub-jovian hemispheres. 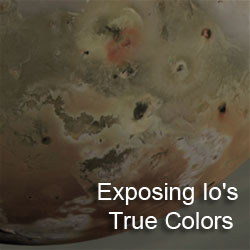 This abstract presents an update of the ASU groups regional geologic mapping of Io that has previously covered: Chaac-Camaxtli, Culann-Tohil, Zamama-Thor, Amirani-Skythia-Gish Bar, and Zal. Both regions mapped by the ASU group have complex examples of the interaction between tectonics and volcanism. At Hi'iaka, there are three mountains, two L-shaped mountains named North Hi'iaka Montes (the entirety of which can be seen at right), South Hi'iaka Montes (a degraded plateau to the southeast of the north segment), and West Hi'iaka Montes (a footprint-shaped isolated peak to the southwest of South Hi'iaka). 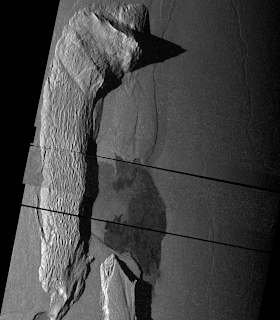 The authors state that their mapping of this part of Io supports the theory that North and South Hi'iaka Montes were once a single mountain that rifted along its long axis (a process seen at several mountains on Io, like North Boosaule Montes and Danube Planum) then underwent right-lateral strike-slip faulting that left mountains in their present locations. The authors then propose that this tectonic motion opened up a depression that would become Hi'iaka Patera. 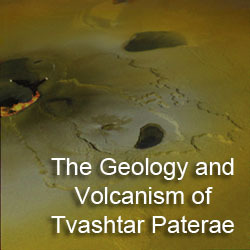 Another interesting tectonic-volcanic interaction in these regions is the extensional fault that NE-SW through Shamshu Mons that also has a small patera along its length (a volcano the authors call Perun Patera, though that name would never be approved since there already is a volcano on Io named after Perun, Pyerun Patera). This, along with the youngest flows within patera following visible fault lines, supports the idea that magma use pre-existing fault lines as conduits for ascent. Another theory the authors tested with these maps is whether differences in mountain morphology are related to age and state of degradation. The mountain units types the authors mapped include lineated, mottled, undivided, and plateau mountain material. According to the abstract, "Mapping results support the theory that mountain units can be uplifted and tectonically modified [like the rifting seen at Hi'iaka and Shamshu Montes], then sloped, scalloped, and leveled by SO2 sapping". The authors suggest that the mountains start out lineated with moderate mass wasting but with many of the original imbricate faults and sub-surface layering still visible. These then degrade into undivided mountain material, a combination of mottled and lineated materials, and then mottled material, which contains hummocky material and a patchwork of bright and darkish material. SO2 sapping at Hi'iaka Montes is evidenced by the bright white plains material that follow the slopes of both North and South Hi'iaka, as well as parts of Shamshu Mons. 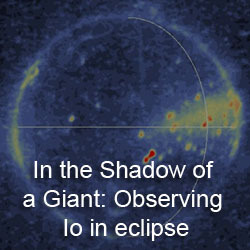 Overall an interesting paper about a very intriguing region on Io. The only complaint I have is that there really is only one more region to map based on available Galileo imaging -- the area around Tvashtar Paterae.